What happens now? A very different Utah team will take the field against Oregon on Saturday. Utes are reeling from injuries to quarterback Tyler Huntley and running back Zack Moss. (Trent Nelson | The Salt Lake Tribune) Utah Utes running back Zack Moss (2) takes the handoff from Utah Utes quarterback Tyler Huntley (1) as the University of Utah hosts Washington at Rice-Eccles Stadium in Salt Lake City, Saturday Sept. 15, 2018. Needing a blueprint for dealing with the absence of their starting quarterback, Utah’s coaches could learn from what Oregon did to the Utes last season, when the Ducks barely bothered with passing while rushing for 347 yards in a convincing victory. The flaw of that strategy was exposed this week, when the state of the Ute offense became even worse. Running back Zack Moss' knee injury, sustained in Wednesday’s practice, followed quarterback Tyler Huntley’s potentially season-ending broken collarbone. The double dose of calamity will force offensive coordinator Troy Taylor to search even further for answers in Saturday’s game vs. Oregon at Rice-Eccles Stadium. The issue of how Utah will respond to losing 84.3 percent of this season’s offensive production in a disastrous, 100-hour period is one subject. The other question is what, exactly, have the Utes done to anger the football gods every November? Whether the latest cause was thoughts of the Rose Bowl, the winged helmets that resemble Oregon’s look or coach Kyle Whittingham’s dismissing “any sob stories” about USC’s depleted personnel last month, something triggered this sequence of events that started during last weekend’s loss at Arizona State. Or maybe the Utes simply are destined to remain the only school never to win a Pac-12 South title, as a condition for their promotion to the conference. The disheveled landscape of the division made 2018 a logical year for the Utes to break through, and that possibility remains in play. Yet at this stage, beating Oregon and Colorado will require the best work of Whittingham and his staff — especially amid the emotional toll of the Utes' losing two highly valuable players and popular teammates, who played together in high school in Florida. 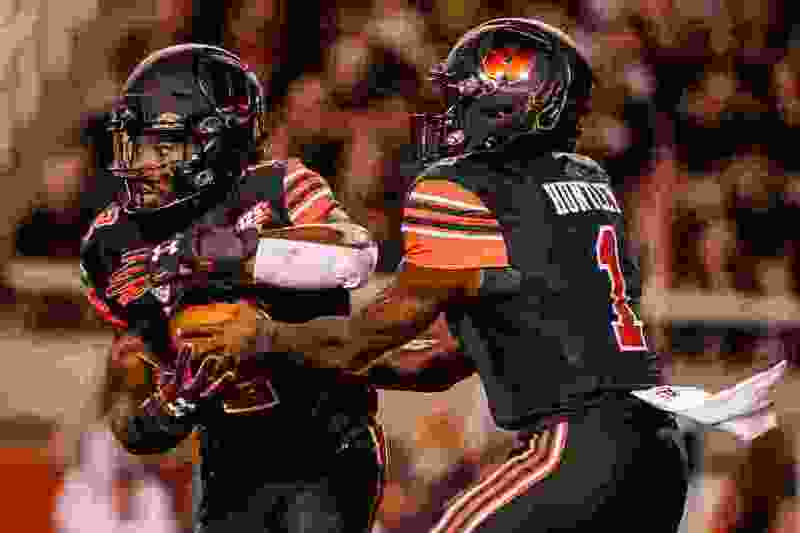 The Hallandale Trio suddenly is reduced to one member, receiver Demari Simpkins, who has accounted for only 221 of Utah’s total 3,776 yards in nine games. As of Tuesday, during media availability, the Utes were convinced they could rally around fill-in quarterback Jason Shelley. But then they absorbed the loss of Moss. So is Armand Shyne, theoretically. Shyne and Moss were considered about even in Utah's program as of October 2016, but then Shyne was injured and also would miss the 2017 season. Thanks mostly to Moss' emergence with 1,092 yards, Shyne has carried the ball only about four times per game this year. Something like this happened to the Utes in November 2015, when running back Devontae Booker missed a 17-9 loss to UCLA, ending their hopes of a South title. And the Utah offensive line is charged with giving Shelley and Shyne any chance for success. The Utes should field their strongest line of the season, with senior center Lo Falemaka healthy after missing all of October and available at multiple positions. Utah has allowed more sacks per pass attempts than any Pac-12 team except Oregon State. Oregon’s offensive line, meanwhile, is the Ducks' biggest issue. Due to a rare targeting penalty on an offensive player, center Jake Hanson will miss Saturday’s first half. Oregon is missing left tackle Penei Sewell, a freshman from St. George, who was having an outstanding season before being injured in October. Records: Oregon 6-3 (3-3 Pac-12); Utah 6-3 (4-3). Series history: Oregon leads, 22-9. About the Ducks: Oregon ranks in the top six of the Pac-12 in every major offensive statistic, including No. 4 in both rushing yards (177.7) and passing yards (265.3). … Freshman safety Jevon Holland leads the conference with four interceptions. … Oregon State will replace Oregon on Utah’s 2019 schedule. About the Utes: Utah ended an eight-game losing streak against Pac-12 North opponents by beating Stanford in October. … The Utes have allowed only 27 points in third quarters in their nine games, although Arizona State scored a touchdown on the first play of the fourth quarter. … ASU’s 285-yard, three-touchdown day dropped Utah to No. 2 in the Pac-12 in pass efficiency defense.